St. Bonaventure University's School of Business is pleased to announce the establishment of three new MBA tracks in its AACSB-accredited online MBA program. Tracks in Accounting, Finance and Marketing (along with the existing General Management track) will now be available to MBA students seeking graduate business coursework that enables them to also manage the demands of their existing responsibilities. The School of Business prides itself on developing responsible leaders with the knowledge and ability to become ethical decision makers in the increasingly complex world of business. Courses offered in the online MBA program have a duration of seven weeks. Students generally take one online course at a time, and two online courses during each semester (fall, spring and summer). The anticipated degree completion time varies from 28 months (seven semesters) to as few as 20 months (five semesters). The MBA Program Director evaluates the timing and extent of the previous business related course work and communicates a detailed Plan of Studies to each student, enumerating online MBA courses that have been waived and online MBA courses required to be taken based on the track selected. The minimum number of credits required for the MBA degree is 30 credits (excluding Foundation courses). 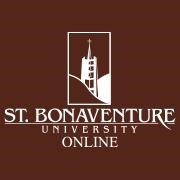 St. Bonaventure University created the online MBA program specifically for the productive adult with a busy schedule. Chief among the University's priorities is providing material that is immediately applicable to the current job market in a convenient fashion. No matter which track a student chooses, the core curriculum ensures that each student has a strong conceptual framework from which to pursue a discipline. Each track consists of four courses. For more information, prospective students may visit online.sbu.edu or call 1-844-424-4960. About the University: As the nation’s first Franciscan university, we believe in the goodness of every person and in the ability of every person to do extraordinary things. St. Bonaventure University cultivates graduates who are confident and creative communicators, collaborative leaders and team members, and innovative problem solvers who are respectful of themselves, others, and the diverse world around them. Named the #5 best college value in the North by U.S. News and World Report, we are establishing pathways to internships, graduate schools and careers in the context of our renowned liberal arts tradition. Our students are becoming extraordinary.